When you employ staff, it’s important to have your policies and procedures in one convenient document that can be referred back to, time and time again. The easiest way you can do this is by giving your employees a handbook, which tells them what is expected of them, shows them that you’re fair and want to treat everyone the same, and provides you with a point of reference if you’re faced with a difficult situation. Let me give you an example. You have an employee who is regularly late for work. Sometimes they call or text ahead to let you know, and sometimes they don’t so you aren’t even sure if they are coming in to work. If you don’t have an employee handbook with a summary of your attendance/time-keeping policy and you try to discipline or even fire this person, they could potentially say that they weren’t aware of the rules because there’s nothing written down. The employee could have childcare or other caring responsibilities, and you could be leaving yourself open to an unfair dismissal claim if you tried to terminate their employment. 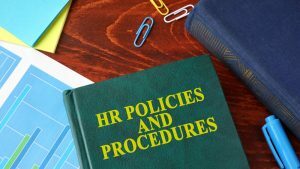 If you had a handbook detailing clear rules on time-keeping, you could clearly show that the employee had breached the terms of the policy, and they were well aware of what is expected. What should be in your employee handbook? 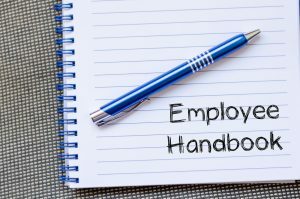 Situations may crop up that are not covered in the scope of the handbook, but more often than not, it will provide you with something to refer to so you can demonstrate what your policy is, and that it has not been followed if you need to confront an employee. • It can prevent you from breaching legislation, such as equal opportunities or discrimination laws. So you have a handbook, now what? You can produce the smartest-looking handbook, full of everything your employees need to know, but it’s only worth something if it’s used properly. Here’s what you need to do. 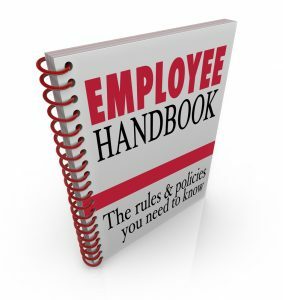 • Update the handbook regularly to reflect any policy changes and make sure employees know about it.